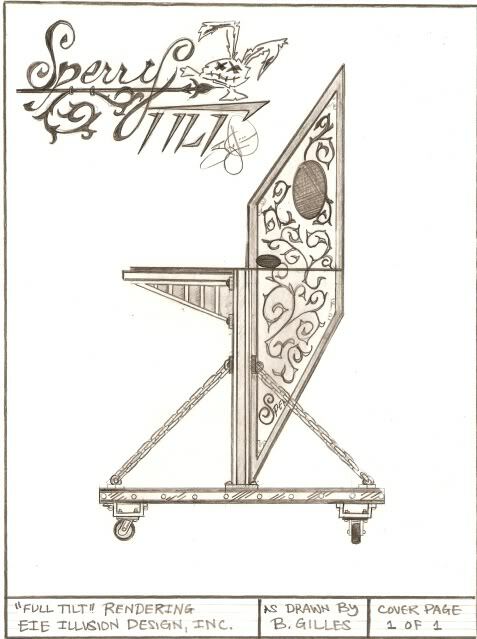 Dan Sperry’s “Tilt” Illusion… A COPY??? I figured I would set the record straight! I am the creator of the method behind “Tilt;” however, I cannot take all the credit as it was a collaborative project by both Dan Sperry and myself. This was an exclusive piece for Dan so we were quite shocked to see other similar Modern Art-esque illusions surfacing thereafter. I did run this method by Jim Steinmeyer (the original creator of Modern Art) through emails and made sure that (scenically) this was a Modern Art with a “magician fooler” twist. It is a great piece and one I am proud to have been a part of. “The history of this illusion goes back about a year or so ago. Bryan was living in Vegas working for Dirk Arthur. We had met up at Boomers one night to go over his portfolio and just hang out and catch up. As he was showing me some of his renderings he showed me a picture of a modern art illusion design he had created and it really caught my eye. At the time I had really no interest in it because in the end it was still “modern art”. I have nothing against Modern Art so please don’t take me wrong. I actually used to own one that was built by Jack Murray of Dream Illusions. It was a fun illusion and I liked it more than my Cub-Zag but for some reason it still just didn’t sit well with me and didn’t feel like it was my style and there were certain design elements about it that I just didn’t like from a “by the book” Modern Art. Bryan showed me this version that had more leg exposed with animatronic-esque parts and a different design of the box completely which basically allowed more of the girl to be exposed rather than just “in a box” ala Zig-Zag type style. Basically one leg stuck out more and one had was up above her head etc etc. It is hard to explain and I don’t want to give away the design. That night he asked me my opinion etc etc and I suggested a few things, one of which was the “Tilt” effect just as some icing – a little eye candy. The original design to use was a more bio-mechanical Gieger-esque box type thing with the shelf instead of the table, etc etc. Now fast forward a few months to where I’m doing more road shows and loading into theaters where I have to do a more economical version of my live bigger show and need illusions which don’t need special lighting or staging. Modern Art was one of the first ones I had in mind but I didn’t want to have to suffer through the original design again so I called Bryan. We worked out a deal. And I purchased the exclusive rights to the Tilt. At the time he was possibly going to release it in a book and with Tim Clothier if my memory serves me correctly. So I snatched it up like a Spanish flyed prom date. Now comes the fun part…well…the work I guess you could say haha. I have a builder here in Vegas I work with. So I took the design to him and we worked on it. When it was all said and done the price to have the original version built was WAY out of my budget so over the course of a few weeks we re-designed it to be a more economical baby brother version. So I still own the rights to the original model and when I have 10 Grand to spare it will be the first thing I’ll have built. But for now the “Tilt” will have to do until I can afford the “Full Tilt”. What you saw on YouTube was a show we did and decided to bring the Tilt along with to get video on a real stage – as opposed to our garage or something similar – and to get it on a stage to work out the bugs etc. At the time we didn’t have the cash to get a cast mold made of Temika’s legs so we worked with what we had and unfortunately all we had were these black pants for now. Because of the position she is in she needs a special kind of pants because there is A LOT going on inside the box – Kline can testify to that. Plus, the box is made to Temika’s size so it is SMALL. Anybody who’s seen it will tell you that it looks incredible because there is really no room for her to move or “hide”. So when you see this life it looks ridiculously deceptive because the depth of the box is I believe 13 inches? I need to go back and measure. That’s the part I’m most proud of is just the sheer size of the prop. I highly recommend to anybody getting an illusion made for their assistant to get it made to their size. You see so many modern arts and Zig-Zags where the assistant can literally swim in there. The flame we’ve replaced with flash cord dipped in sparkle powder so you get that cooler look that a little creeping flame. 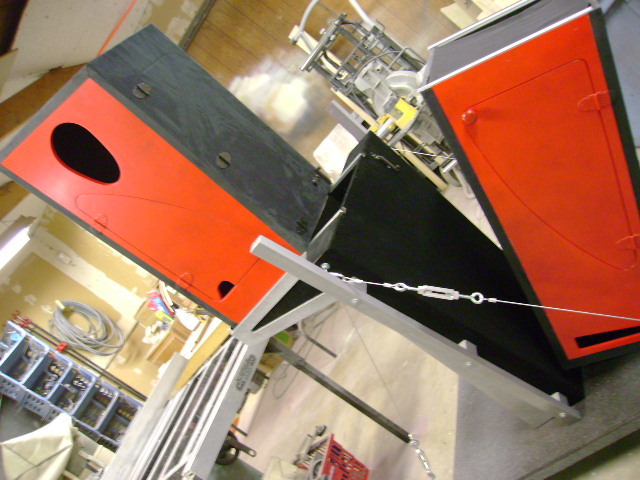 We’ve also added a giant grinder to give the impression of a “cutting”. The tilting we can now leave the door open. That was the original idea is to tilt it with the door open but because we had to jimmy-rig some fake legs that I’ll admit didn’t look the greatest we didn’t want to leave the door open when tilted. Now we can and do. The only thing I’m not sure on is a spin. I’ve never really liked to have to spin an illusion unless it is absolutely necessary. What do you guys think? Spin the box? I was thinking maybe spin it hard and then have the tilting happen almost like an accident – an idea from Chezaday was to have me maybe lean on the lower box and have the tilt look like an accident maybe. The beauty of it is I can tilt it if I want. If I feel like performing it without the tilt I can but I figured the tilt would help further show distance and a cutting. Its like when you do the sawing in half you don’t just pull the upper part away you pull both boxes away, I wanted to add that real idea of separation. Dan Sperry is an incredibly talented illusionist touring the world as you read this! Be sure to check out his current performances at Time Scare in NYC; as well as his performances in The Illusionists currently touring in Asia and South America!